Build a simple mobile tool cart to keep tools organized and accessible wherever you are in your makerspace. Assembling a rolling tool cart requires just one or two people, simple tools, and materials that can be cut in advance at your local hardware store. All steps can be done by one person, but for some steps an extra pair of hands can be helpful. Assembling a rolling tool cart takes only one or two people and minimal tools, and materials can be pre-cut at your local hardware store. 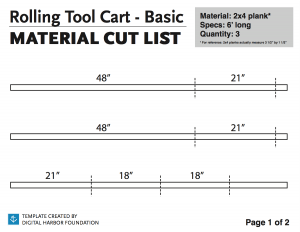 Cut three 6-foot 2×4‘s into seven planks as shown in the cut list shown in the image. 6-foot lengths will waste the least amount of material, but 8-foot lengths may be easier to find. We recommend spending an extra dollar or two per beam for “top choice” lumber, which is much better quality and less likely to be bowed or twisted. Also note: 2x4s actually measure only 1 1/2″ x 3 1/2″. Pegboard, also known as perforated hardboard, is generally available in two thicknesses: 1/4″ and 1/8″. For this project, make sure that you purchase 1/4″ pegboard; it is much sturdier and fits most standard size pegs. 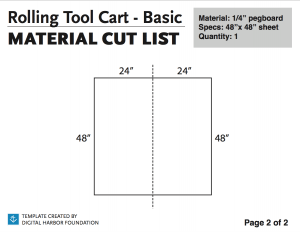 Most hardware stores carry 1/4″ pegboard in a dark brown color and will cut sheets down to size for you according to the cut list shown in the image. We purchased 4×4 sheets in a lighter brown color which blends nicely with the natural wood color of the 2x4s, and cut each sheet in half ourselves using a circular saw. A basic Durahook multi-pack will contain everything that you need for one tool cart. In fact, it will contain more than you need, so you might want to consider buying peg hardware individually. Pro tip: sometimes peg board hooks can pop out when you remove a tool. To eliminate this problem we chose Durahooks, which come with mounting screws to semi-permanently attach each hook. The pegs can still be rearranged when you want, but the screws prevent them from coming off while you are working. Our rolling tool cart is made from a simple frame built from 2×4’s, with pegboards attached to both sides of the frame and caster wheels mounted to its base. At the end of one of the two 48″ side posts, use a pencil and tape measure to mark a line 3/4″ from one end. Then mark cross lines 1″ in from each side edge to indicate screw hole targets, as shown in the figure. Repeat these marks halfway down the side beam at the 24″ mark, and again 3/4″ from the other end of the beam, for a total of six screw hole marks. Then repeat these six marks on the other side beam. Select a drill bit the same width as the shank of the 2” screws, and use it to drill pilot holes through the side posts at each of your earlier marks., for a total of six pilot holes on each of the two 48″ side posts. Drill each pilot hole approximately the depth of the length of the screw; for more information see Wikihow’s helpful step-by-step guide for How To Drill Pilot Holes. Place the three 21” cross beams standing up on the floor in an evenly-spaced line. Then lay one of the 48” side posts across the top, with the pilot holes facing up so they are visible. Make sure that the center cross beam is centered with the pilot holes you made at the 24″ mark of the side beam. Line up the corners of the frame so that the side post is flush with each of the three cross beams. Drive 2″ screws into each of the six pilot holes on the side post, two through each of the three cross beams. An extra set of hands is helpful for this step, but it can also be done standing over the boards and using your legs to help hold them in place while you drill. Once secure, flip the frame over and repeat the process: Lay the other side post across the cross-beams so that the pilot holes face upwards, check alignment, and then drive 2″ screws into the pilot holes to secure the frame. At each of the four corners of one of the pegboard pieces, use a pencil and tape measure to mark a screw hole location 1″ in from each edge. Note that although this will not be directly centered on the beam, it is more likely to avoid matching up with one of the existing peg holes. Repeat marks for the other piece of pegboard. Lay the frame flat on the floor and line up one sheet of peg board on the top. Make sure that edges are aligned and square all around the board. Use 2” wood screws to attach each of the four corner of the pegboard to the frame. It is not necessary to drill pilot holes for this step; just start the drill with a few quick bursts to drive in the sharp tip of the screw. Once the screw bites into the pegboard you can drill full speed to drive it the rest of the way in. Repeat the step above, adding more screws around the pegboard to secure it to the frame. We suggest the placements shown in the figure. Be sure that the center screw location passes through the center cross beam of the frame. Flip the frame over and repeat the process: align the pegboard with marks facing upward, check alignment, and then drive in 2″ screws to secure the pegboard to the frame. Mark each of the two 18″ foot boards halfway in the center, at the 9″ mark. Then make a cross-mark 1” from each side. Place a wheel the end of one of the foot boards, centered about 1/2” from the edges. Use a pencil to draw a small X to mark the center of each hole and then set the wheels aside. Repeat for the other end of the foot board and for both ends of the other foot board. Select a drill bit that has the same width as the shank of the lag screws. Pro Tip! To prevent drilling too far into the legs, place a piece of tape 1” from the tip of the drill bit to “flag” it. You’ll know when to stop when the flag reaches the surface of the board. Drill pilot holes into each X-mark on the foot boards, stopping when the drill bit flag reaches the wood. Position each wheel over a set of pilot holes in the footboards and secure the wheels by using the socket wrench to drive the lag screws into the holes. Turn the frame so that it stands up on the floor. Position each leg at the edge of the top of the frame, and align the 9” mark on the leg with the center of the frame. Choose a drill bit that corresponds to the 3” deck screws, and use it to drill pilot holes at the marked locations on each of the footboards. Find a driver that corresponds to the 3″ deck screws. Deck screws often have star-shaped heads and come with the matching driver in the box. Drive the deck screws through the pilot holes to secure the footboards to the frame. Flip the frame over so that it stands upright on its wheels. Lock the wheels in place by stepping down on the “On” switch on each lever. Place top of the handle flush with the top of the frame and put a mark on the frame at the bottom edge of the handle, about 5 1/2″ down from the top. Repeat for the other side of the frame. Move the handle down so that your mark passes through the top holes, and then mark a small X in each of the four hardware holes. Repeat for the other side of the frame. Drive in the screws that came with the handle hardware set to secure the handle to the frame. Repeat for the second handle on the other side of the frame. Now that you have a tool cart, what tools should you put in it? Below is a list of the tools that we’ve found the most useful, and how we chose to arrange our tools on the rolling cart pegboard. Here’s how all these tools look when hung on the front and back sides of our tool cart. Click the image to zoom in if you want more detail.